As a mom of two girls, Beat Bops co-founder Andy was struggling to find a baby class that was the right fit. She found a lot of the classes she tried were often sedate or very traditional. After chatting to a good friend, who is also a qualified speech and hearing therapist, they decided to write their own programme to fill a gap in the market. “I wanted a class that was short enough for my little girl to make it through the class without needing a nap or a feed or just getting irritable. Having the opportunity to be at home with a baby or toddler is so special and also fleeting. I wanted a class I could go along to where I would enjoy myself and get lost in the moment, having fun and bonding with my little one. I didn’t want to be given set tasks or feel like I was being lectured to,” says Andy. Queue songs, singing, actions, leaping and bounces! Maddie and I were invited to attend a Beat Bops class with Andy in Hillcrest to experience the class first hand and I have to say, seeing Andy’s love for children and her evident passion for early childhood development is absolutely incredible. The music based class supports all areas of child development including emotional, social, intellectual, motor, language and literacy. 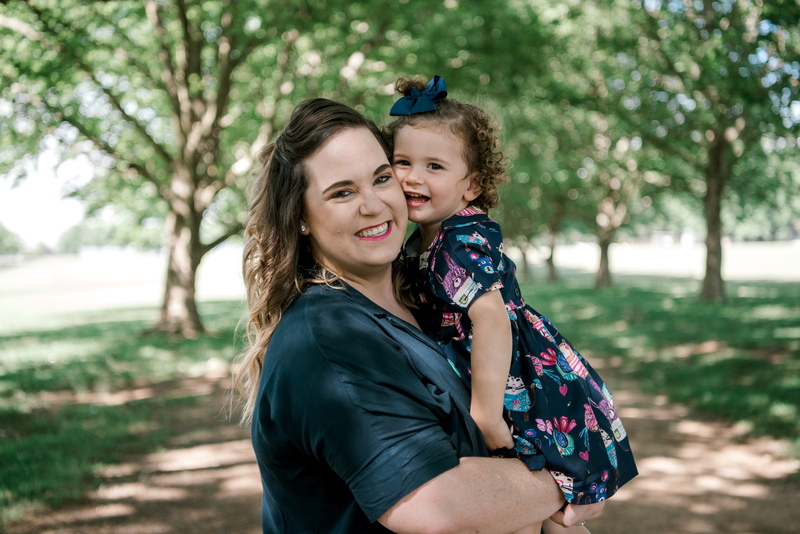 Understanding that spending time with your little ones should also be fun for both parent and child paired with the fact that early childhood development is key to success later in life, Andy and her business partner started running their first classes in June last year. The class is energetic, highly-interactive and fun. When Maddie was a baby we attended a few baby classes and if we compare a few of them to our session with Beat Bops, the classes are so modern, bold and different! Andy and her business partner has personally written and recorded their own songs to make sure they have a unique sound and include the elements of early language and gross motor skills. Think dress up, playing with puppets, dancing with scarves and 45 minutes of pure magic! Another stand out for us speaking to Andy after the class was the fact that she understand that life with little ones can be tricky and is often unpredictable. For this reason she has the option to ‘drop in’ to a class on an ad hoc basis and also the option to buy a block of classes for use flexibly throughout the term, in addition to offering a termly sign up. This is something so unique and for a working mom like myself, I really appreciate this as I couldn’t always make a class when Maddie was little due to work commitments or meetings while some weekdays I could take an hour out of my day to take Maddie to a class. The planning and research that goes on in the background to make a class happening is super evident in the class. From the fun and colourful props (which seem never ending) to the educational aspects of the songs, rhymes and themes used to develop pre-verbal communication skills such as gestures, turn taking, eye-contact, auditory discrimination and active listening to name a few. My favourite part… Andy has a different theme each week at every class and the theme is always introduced in the same way. When it’s time to discover what’s in the box for that week, all the children gather round to look what’s inside, and trust me – even the child who never ventures off mom’s lap can’t help but come to have a look! The big reveal always involves an element of dress up, props for role/ imaginative play and also activities for fine and gross motor skills the excitement levels soar! The class begins with a movement song called the ‘Hello Song’ which sees the Beat Bop mascots, the ‘Boppers’ come out to greet the children with a tickle and a kiss while the song they sing re-enforces phonological development. After that we moved into finger plays and rhyme time (which are invaluable to teach vocabulary, comprehension, practice memory skills and co-ordination), lap bouncing (used to develop the vestibular system) and peek-a-boo. Maddie loved getting active with scarf play and the parachute which encourages gross motor skills, moving in time to a beat and working as a group. After this it is time to explore the weekly theme, an assortment of insanely clever imaginative play, gross motor skills and songs. I was personally blown away by the activities set out for the kids by Andy. She really ran with the dinosaur theme with each kid being given a dinosaur tale and gloves to out on their feet (how clever!) and the activities Andy laid out were brilliant and super educational. From ice blocks with dinosaurs inside in which the kids needed to hammer to break open to a dinosaur skeleton which the kids had to place the different sized toilet rolls on top. Pure genius! The class is the perfect balance of fun structured and unstructured play, giving the littles ones a great boost in mental and physical development and also allowing for group play and socialisation. The finish is very sweet too. Andy brings out a sensory blanket followed by snuggle time and a twinkly light show which is a great opportunity to share cuddles and kisses with your little one. This had an incredible effect of calming Maddie after the busy class. Beat Bops can accommodate babies and children of all ages. The classes depend on the stage of development your child is at. Baby Beats is for babies who are sitting (be it with support or own their own) through to beginning to walk. Mini Bops is for babies walking confidently, up to the age of three. They also run mixed aged family sessions once a month on a Saturday morning which caters for siblings and grannies to join in. Beat Bops run weekly classes as well as a Saturday session in the Highway area and are launching for the first time in Durban North at Heatherbelles (4 Swapo Road, Durban North) starting on 29 January with weekday classes and once a month Saturday sessions. This will be a free trial class (on 29 January 2019) however sign up is required. A full term sign up is R650, you can buy a block of six classes for flexibility throughout the term for R450 or pay just R80 per class at a drop in rate. Sign up and pay for a full term of Beat Bops before 31 January 2019 and get 15% off the full term price of R650 when you quote “Being Maddie’s Mom”. Disclaimer: This is a paid for sponsored review. Although it is paid for it is honest and in no way influenced and is my own opinion. The faces of the kids in the photographs have been blurred for their protection and privacy.